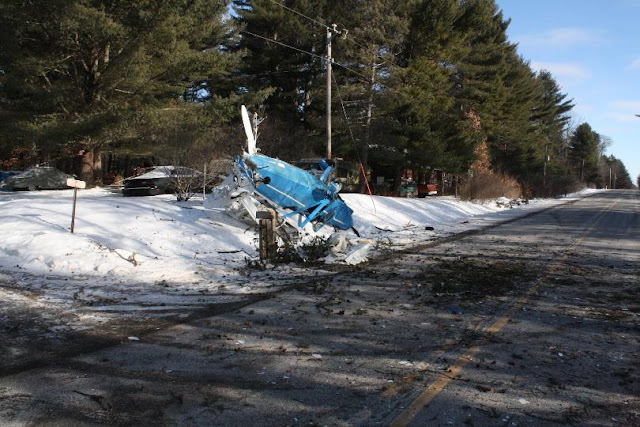 On January 19, 2019, about 1130 central standard time, a Stinson 108-1 airplane, N97969, impacted trees and a road while executing a forced landing near Keshena, Wisconsin. The pilot and one passenger sustained serious injuries and two passengers sustained minor injuries. The airplane sustained substantial damage. The airplane was registered to a private individual and was operated by the pilot under the provisions of Title 14 Code of Federal Regulations (CFR) Part 91 as a visual flight rules personal flight. Day visual meteorological conditions prevailed at the time of the accident, and no flight plan was filed. The local flight originated from the Waupaca Municipal Airport (PCZ), Waupaca, Wisconsin, about 1100. The pilot reported that the purpose of the personal flight was to travel to Ford Airport (IMT), Iron Mountain, Michigan. While in cruise flight, the engine sustained a momentary and substantial loss of rpm. The pilot applied the mixture to the full rich position, activated the carburetor heat, and switched to the right fuel tank. The engine recovered and the pilot left the carburetor heat on for about 3 minutes and then slowly turned it off. About two minutes after the carburetor heat was turned off, the engine ceased producing power. The pilot reported that once the engine stopped, it did not "windmill." The pilot activated the starter and it did not engage. The pilot observed an asphalt road surrounded by trees on both sides to execute a forced landing. During the landing, the airplane impacted the trees and bounced on the road, coming to rest upside down on a snow-covered embankment. The occupants were able to egress without further incident. The airplane sustained substantial damage to the fuselage, both wings, and the empennage. The airplane was removed from the accident site and transported to a secure location. On Saturday morning the Menominee County Sheriff’s Office was dispatched to the area of County Highway M approximately one quarter mile east of State Highway 55 for a report of a single-engine plane crash. Officials say the investigation revealed the pilot and crew departed from the Waupaca area and were heading to Iron Mountain, Michigan. There were four occupants onboard who sustained no life-threatening injuries as a result of the crash. The pilot and one back seat passenger were transported to medical facilities for their injuries.